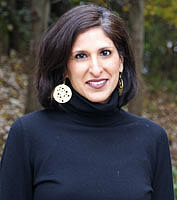 Dr. Avni Chhabra Rampersaud is from Alexandria, Virginia. She first moved to the Triangle to attend Duke University. She graduated from Duke with a B.A. in English. She then attended the University of North Carolina School of Dentistry. She completed two additional years of specialty training in Pediatric Dentistry at Children’s National Medical Center in Washington DC. In 2007, Dr. Avni Rampersaud achieved Diplomate Status as a Board Certified Pediatric Dentist with the American Board of Pediatric Dentistry. Dr. Rampersaud is an Adjunct Assistant Professor in Pediatric Dentistry at UNC. She maintains a hospital staff appointment at University of North Carolina Hospitals. Dr. Avni Rampersaud’s husband, Edward, is a urological oncologist at Duke University Medical Center. They reside in Durham with their daughter, Saia and son, Milan.